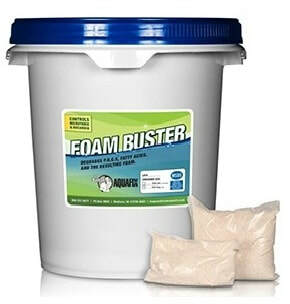 Foam Buster is a micronutrient blend that controls foaming by giving the naturally-occurring bacteria biostimulants to fully digest grease and fatty acids. Available in 30 lb pail w 1 lb packets and 50 lb bulk bag. Provides a fast way to breakdown grease and long chain fatty acids that can build up in wastewater plants and cause foaming. Use with Foam Buster to accelerate results. Works great in SBRs! Available in 5 gallon case and 55 gallon drum. FC REL is a 100% active synthetic defoamer that is a extremely effective deaerator and defoamer in aqueous environments. FC REL does not contain mineral oil or silicon.